Slowdown in activities in the Singapore private residential market but prices are still relatively stable. Casting its net wider overseas; penetrating China market with JV in Hainan. We hosted a NDR with APAC Realty yesterday, to get an update on the property market post the latest round of property cooling measures implemented in July. Overall, the market saw a slowdown in take up rates for new private property launches but prices are relatively stable as developers are now more realistic in setting prices for new launches. In the HDB segment, the number of transactions has improved. Going forward, in view of the volatile Singapore, APAC is beefing up its overseas exposure. 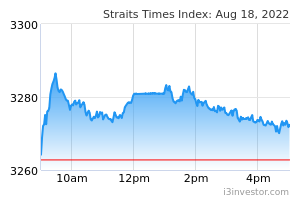 No change in forecasts; maintain HOLD, Target Price: S$0.62. The take-up rates for new project launches have been slower post the latest round of cooling measures. On average, about 20% were sold during the first round of launch, vs about 30% to 50% before the cooling measures. Among the buyers, about 75% are first timer vs about 60% previously, while only < 10% are foreigners. In terms of market transactions in the private residential segment for new projects, the average monthly sales in 1H18 was 657 units, vs 1,724 in July (skewed by the 1000 units sold on the day the cooling measures were announced) and 560 units in August, partly affected by the Hungry Ghost festival. In the private resale market, an average of 1,427 units per month were sold in 1H18, vs 1,092 in July and 419 in August. On the contrary, the volume in the HDB segment increased to 2,551 in July, from 1,733 in 1H18, possibly due to spillover demand from the private segment and also the government’s reiteration that older HDB flats are still valuable. APAC is expanding in the Asia-Pacific region with the ERA regional master franchise rights that it has for 17 countries that it secured back in 1999. To date, it has significant presence in Singapore, Japan, and Indonesia and has also signed a master franchisee agreement for Cambodia in February 2018. The franchise model enables the group to increase its regional presence and network in a capital- efficient manner. Other than the franchise model, APAC has also formed a joint venture (JV) in Hainan, China recently in which it has a 40% stake in the JV company. The JV company will conduct brokerage and resale brokerage businesses, as well as establish training and licensing of real estate agents in Hainan. This agreement is a key milestone for APAC, presenting the group with an opportunity to penetrate the China market. This allows APAC to have more participation and control in the business with better profit margins through its equity participation. We expect minimal contribution of less than S$1m to APAC’s bottomline from this JV. Going forward, we can expect more of such collaborations in overseas markets. We maintain our private transaction value assumptions of a 5% drop in FY18F and flat for FY19F. 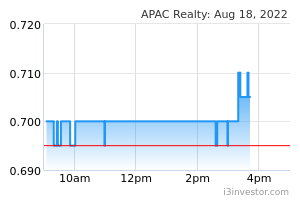 For the HDB segment, we have maintained our flat growth assumption. Thus, no change in our earnings forecasts. In FY18F, turnover is expected to be flat as APAC has 11 projects that were sold but yet to be invoiced. These projects include New Futura, The Tapestry, The Verandah Residences, Rivercove Residences, Twin Vew, Affinity at Serangoon, Marina One Residences, Riverfront Residences, Park Colonial, Stirling Residences, and The Tre Ver. Our target price of S$0.62 is pegged to 10x FY19F earnings. Maintain HOLD.